There are many things in history where the only true option of explaining them is to simply give a vague description of when it happened. For example, we don’t know exactly when the universe came to be, but we’ve got an idea. You know, the scientific equivalent of saying it was x-ish-number of years ago. If you were to ask me when zombies sudden became the most popular subject matter of video games, I’d probably shrug and say “It was like five or six-ish years ago.” My first exposure to zombies was in the 1978 classic, “Dawn of the Dead” by the father of the modern zombies, George A. Romero. Housemarque, an independent developer, has been making some awesome games for the PS3 and now the PS4. 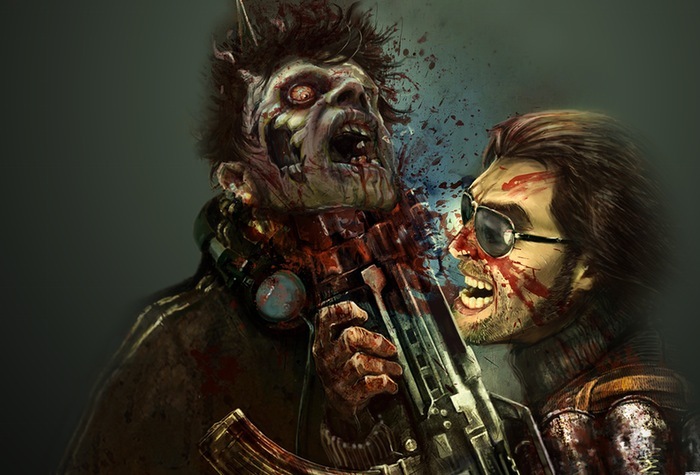 Known for releases like Super Stardust HD and Resogun, they also did a well known top down, or isometric zombie shooter for the PS3 called Dead Nation. Now, for the low, low price of free for PlayStation Plus members, you can play Dead Nation: Apocalypse Edition for the PS4. The horde of zombies approaches, time to see if this game is your ideal training tool for the inevitable zombie outbreak. Dead Nation attempts to place a story between it’s ten levels, but these attempts are few and far between. The game opens with a promising premise. You play as one of two survivors who, at the onset of the zombie outbreak, discover that they are in fact immune to the bites from the zombies. There’s no explanation as to whether these zombies are magical or viral in origin, but the concept of two people who are immune is enough to allow the suspension of disbelief when you’re being consistently clawed and bitten during the course of the game. The cut scenes are hand drawn, with occasional pans and a voice-over that does a decent job with the acting. These scenes only occur between levels and are usually less than a minute or two long. They usually establish some sort of reason for the next mission’s existence, and little more. While a arcade game like this doesn’t live or die by it’s story, I can’t help but feel like there was a missed opportunity here. If anything, all zombie games to dance around the story and stick to tried and true traditions of survival storytelling. More cut-scenes and more story would have only added to the experience and provided more context as all stories do. The acting was good enough and the style of the cut scenes calls to mind games like Infamous or Mirror’s Edge, which utilized their scenes to convey more story than Dead Nation does. Again, an arcade shooter isn’t exactly expected to feature a story that rivals the greatest works of literature, but the addition of it could have been a great boon to the game’s already solid premise. As a lover of great stories, this aspect of the game came up as expected. Not disappointing per se, but like any person I loved to be wowed. Dead Nation stuck to status quo in this department. The PS4 release of Dead Nation: Apocalypse Edition includes the Road to Devastation DLC. The gameplay is a top down or isometric shooter. This means you’ll spend the entirety of the game looking down on the detailed environments as your characters fight using a variety of projectile weapons. The levels are fairly linear in this regard, featuring side areas for the sole purpose of finding additional loot. I would highly recommend playing with a friend on either local co-op or online. I played on the normal difficulty and found myself consistently overwhelmed at the number of enemies charging toward me. The zombies will come at you as you move through destroyed streets and dilapidated environments from all directions. You’ll find weak ones, exploding variants, jumpers, howlers, and other types of zombies. The game is constantly testing you, with little more than brief moments of reprieve between charging hordes of the undead. The checkpoints aren’t very forgiving either. You’ll find health packs that enemies drop or you can melee vending machines to receive one. Beyond this, there’s no health regeneration so don’t let them get too close. If they do, you can melee them, but I found backpedaling to be a perfectly viable strategy. As you reach the few and far between checkpoints, you’ll find yourself in a temporary safe zone. Most likely fighting heart palpitations and watching the undead claw at the gate you just entered from. Here you can spend your hard earned money to purchase weapons and weapon upgrades. These upgrades are varied and beneficial to each weapon. Beyond your rifle, which has unlimited ammo, you’ll also need to purchase ammo for every secondary weapon you purchase. You’ll unlock and SMG, Shotgun, Flamethrower, Blade Thrower, and more in addition to grenades, flares, and mines. Lots of options to destroy the undead hordes. One particular aspect I enjoyed was the environmental interaction. Gas tanks explode, car alarms will go off and attract hordes to them, eventually exploding in a gory shower. All of these is designated by red rings around the objects that show how large the ensuing explosion will be. Overall, the gameplay here is fast and frantic and perfectly deserving of Housemarque’s reputation. That being said, the major caveats I have here is that the camera can sometimes be obscured by objects like trees or buildings. In addition the armor system doesn’t allow for direct upgrading of your armor, but rather you can equip armor you find. I would rather be able to upgrade it, because the game’s difficulty is punishing even on normal. Finally the spare checkpoints make dying a major frustration. That being said, if you’re playing co-op and your partner manages to reach the next checkpoint, you’ll be revived which I was very happy to see. The additional “Road to Devastation” content is included with this release of the game. This content brings several new modes that don’t essentially add much to the game as they don’t push the story forward in any way, but they do add some modes that bring some additional gameplay elements. These don’t add anything substantial to the game, but the “endless” and “arcade” modes, along with the alternate round by round progression do make the game feel different. The major addition to the PS4 release is a new mode called “Broadcast +” mode. This mode allows viewers to change the game’s settings while streaming on PS4. This means that they can alter over thirty different effects whilst watching, including blocking ammo drops, and making more enemies for the player to fight. They can of course, provide helpful additions, but this mode does a great job of doing some innovative with the PS4’s streaming capability. Even if it’s not something that most people will use. Also, the PS4 release brings a new “Challenge” mode that allows players to go up against other player’s scores on a global leaderboard. The PS4 release of Dead Nation brings with it upgraded graphics in the form of detailed textures and 1080p resolution. Also the game runs at a solid thirty frames per second without any dips to be seen. The overall style of the game is gritty and detailed. The top down camera doesn’t allow the player to appreciate the action up close, but does provide a mostly perfect method of viewing it. With the ability to play local co-op or online, the multiplayer features are all there. The graphics don’t, by any means, push the PS4 to its limits, but it does look nice on the PS4 compared to the original release over three years ago. Dead Nation: Apocalypse edition is the premier version of Housemarque’s solid arcade shooter. For some, the gameplay may be addictive and unforgettable, while others may find it repetitive and bland. I myself found it to be a mixture of the two and enjoyed my time with it. That being said, the upgraded graphics and included DLC do provide a lot of extra gameplay to delve into. I do also enjoy the support for local co-op. The game finds faults in a almost non-existent storyline and a intense difficulty for novice players. As a zombie arcade shooter, it fares well enough. I went into it knowing exactly what I expected from such a arcade game, and I received exactly what I expected. No surprises or amazing innovation, just a solid game. Could it have been better? Sure, but what they have made here is a game that for the price of nothing, is absolutely worth playing. Have you played the PS4 version of Dead Nation yet? Did you play the original PS3 release at all? Tell us what you thought in the comments!